With Easter at the end of the week I'm all about speckled nails! So I decided to try out my latest speckled/matte glitter top coat, Maybelline Color Show Street Artist in Alley Attitude (£3.99 - Superdrug here or Boots), a beautiful turquoise and black mixed glitter. As mention in my latest makeup haul post I was unsure what colour base coat to pair it with, white just seemed too obvious and I felt a bright base could clash. But then I remembered my favourite shade from last spring/summer - Essie Bikini So Teeny, a perfect light blue. I feel this is just a perfect pairing for summer but I can now see any pastel shade working with Alley Attitude. 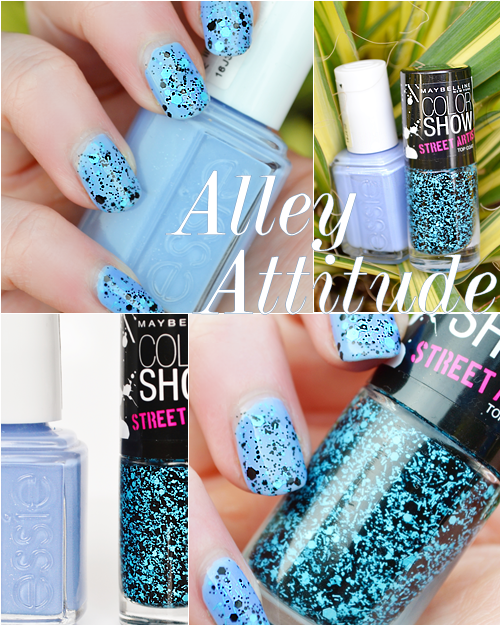 Alley Attitude is one of those top coats that is a breeze to apply, just a single coat with a glossy top coat to keep it snag-free. Plus it's one you will get compliments on as the black pieces really do stand out and make people notice your nails. Overall I am super impressed with this top coat. It has the ability to change up any manicure and looks totally different dependant on the base colour you use - here I have use a light blue base but white would look great as would black to make the blue pieces more visible. Also unlike some top coats you don't have to fish about with the brush in the bottle to get enough on the brush, this really is packed full! Without a doubt one of my favourite nail polish buys in a long time. The look of this matte glitter top coat has definitely convinced me to picked up a few more (there are 4 in the range) when shopping next. Worth every penny!